Do You Have to Certify A Service Dog? – ComeHereBoy! Do You Have to Certify A Service Dog? When I started looking into service dogs, I was so confused. I heard many different terms used: Service Dog, Emotional Support Dog, Therapy Dog. There were vests and websites for registering and places who sold trained dogs. It was really confusing to figure out what was needed to get a service dog for anxiety. One of the things I really didn’t get was whether or not a service dog needed to be certified. 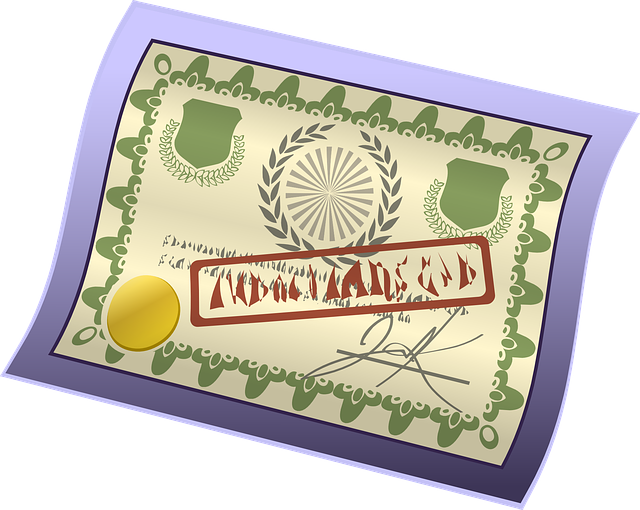 There are websites out there that sell vests and cards that indicate you are “registered” or “certified” through them. They act like you need to use their special registry to go anywhere with your dog. But do you really have to certify a service dog? The answer is no (in the U.S.) There are some recommended guidelines for service dogs (and some best practices), but no registry, no certification and no regulated training is required for your dog to be a service dog. This means that if you are qualified as disabled, you can use a rescue dog, a shelter dog, your own dog, a dog from a breeder or a dog bought pre-trained as a service dog. Pre-trained service dogs generally come with one of two things: a high price tag ($20,000 +) or a long waiting list and prerequisites (3 years +, no other dogs, only certain disabilities). This is why many people choose to owner-train their service dogs. Your service dog is also not required to wear a vest in many states and you are not required to carry any sort of registration or card. Some people do choose to carry a small, laminated print-out of the ADA law to hand out in case they are asked for proof that their dog is a service dog. Some states do require service dogs in training carry an ID card or wear a vest, but service dogs in training are subject to state law, not federal. The short of the ADA law is that a public place is not allowed to keep you from being there with your service dog unless your dog is not house trained, or it is causing a disturbance. Employees are not allowed to ask what your disability is or ask for any certification. They can only ask you what tasks your service dog does for you. Your dog must perform at least one essential task for you to be qualified as a service dog. Many people still use vests just to fend off questions, keep people (hopefully) from petting their dog and to indicate to the dog that it is “working”, which is fine, but it’s important to know that in many states there is no law that you have to have one on your dog. 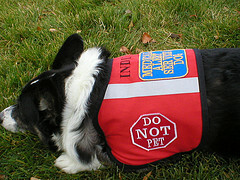 It’s also important to know that you should not put a service dog vest on your dog if your dog is not well-behaved and trained to perform necessary tasks for you or you are not disabled. When this happens, it ruins accessibility for people who actually need service dogs and have worked hard to get one. When I understood that I didn’t need to go anywhere special to get a service dog trained or certified, it was an eye opener. Suddenly, the world of service dogs was a lot more open and affordable and easy to understand. My own dog could be trained to help me with anxiety and as long as I trained him to be well-behaved and perform essential tasks for me, I was in the clear. Thank goodness for the ADA laws that make it more approachable! I just wish more people knew about it. Do you have any things that you don’t understand about service dogs? I work with athletes and have seen how having a dog during their practices, training camps and prior to performance, puts the athletes at ease and helps tone down their overwhelming anxiety. Since starting my own sports performance comany and my background of education being psychology, I’ve really want to fuse the two and build a unique brand. My only road block is where and how do I begin! Could you give me some pointers?? Hi Kori! That sounds absolutely like an amazing idea. I think it would depend on if you want to begin by trying to learn how to train your own dogs, or by partnering with someone who does the training for you and then you fuse everything together, while working with the dog trainer. What road do you think you’d want to go down? I am wanting to my dog to be a service dog for my anxiety and panic disorder, is there any documentation needed for when we move into a new rental that does not low dogs? Do I need a letter from my doctor? I have tried so many times and contacted so many people. It’s so frustrating. I have not left my house in seven years. No one ever gets back to me. Please I beg of you my life is nonexistent and I need help. I’ve recently been suffering more with my anxiety and depression. I’ve looked all over the Internet for possible solutions to helping me. I’m a college student and I feel as though I can be too busy for therapy sessions. I began looking at an emotional support dog or service dog and though that may be a possible solution for me. However, I’ve yet to talk to my doctor about my increased anxiety and depression. I’m afraid and unknowing how to approach my doctor. Anyways, I currently do not own a dog but am looking. If I adopt a dog (not currently an emotional support/service dog), can I train the dog myself to meet my needs? Where can I get a service dog vest for my dog that I trained myself? And I should probably carry some sort of certification for my dog when I go to school with her and stuff… any suggestions? Next PostNext Where Do I Get a Service Dog?